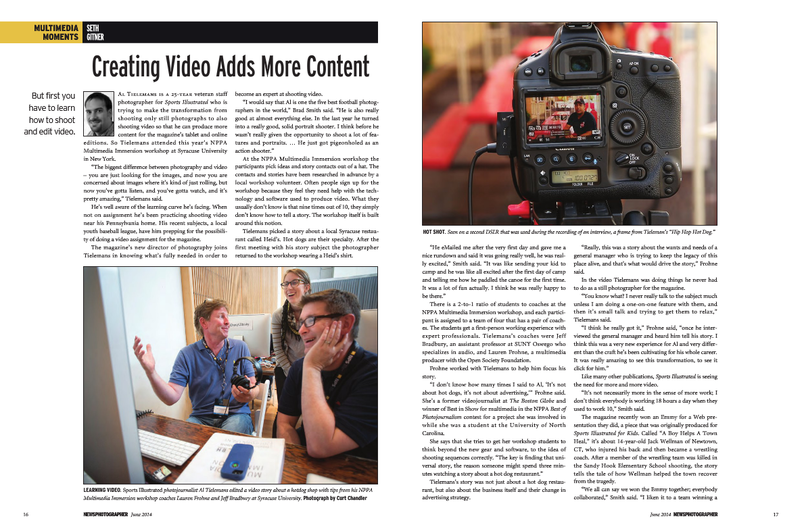 Check out this nice article Seth Gitner wrote in the current issue of NPPA’s NewsPhotographer magazine about Al Tielemans’ experience at this year’s workshop. Al was one of my students this year and it was such a pleasure to work with him. I was fortunate enough to be invited back to coach at the NPPA Multimedia Immersion workshop again this year, now my second time coaching the workshop, May 11-18. I really love this workshop for a lot of reasons, but mostly because of the amazing kinship and bond everyone develops by the end of the week. The workshop is all about opening yourself up to learn new skills, being vulnerable, and supporting one another. It’s also a crazy busy week full of seminars and practice and shooting and editing and staying up all night to finish on Friday night, in time for the community screening on Saturday. That lack of sleep and delirium might also contribute to the overwhelming gratefulness and positivity at the end of the week. The interesting, and probably most challenging, part of Immersion is that everyone starts from zero. People come in with varying experience with video (from a lot to never using a camera before except for their iPhone), so we start at the very beginning. And by the end of the week, every single one of the 40 participants publishes a story. So we see some major transformations over the week. It’s incredible. And exhausting. But so worth it. This year, I was paired up to coach with Jeff Bradbury from SUNY-Oswego in upstate New York. We had four students: a commercial photographer who specializes in hospitality and food, a former magazine director of photography who recently launched his own production business, a web editor for the Newhouse School website, and a longtime shooter for Sports Illustrated. It was a group with varying skill sets and experience. And yes, I did stay up until 4am again helping the last of them finish. While we typically don’t come out with award-winning masterpieces from this workshop, I can say that the skills and experience the participants gain and the amazing network of new colleagues and friends we all build — coaches and participants alike — throughout the week is really worth it.